This brooch can double as a pendant. It is formed from one piece of silver sheet and woven brass wires. The base part is etched and oxidised with a satin finish and the oxide partially removed. The centre was cut away and textured by milling. The surface of this part is burnished. Between the layers is a roughly woven mesh of brass wires. The brooch has a hinged double pin made from hand formed parts. 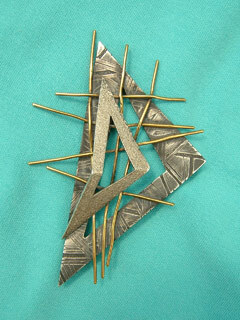 This brooch was exhibited at The Clothes Show, Pebble Mill Studios.